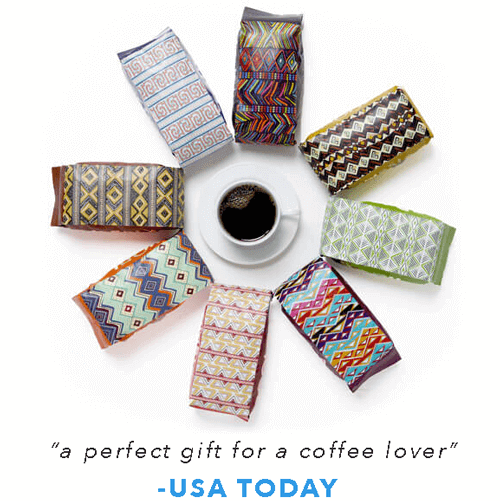 Are you a coffee drinker who likes to buy or grind their coffee in bulk? Having issues keeping your coffee beans fresh? Coffee tasting bitter? Your coffee is probably being exposed to too much air and light and being kept for too long past its expiration. This is the fast track to an unpleasant coffee drinking experience. 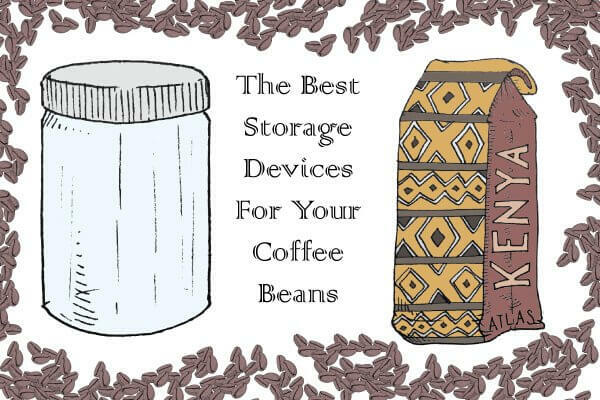 We can only think of a few worse ways to start out the day – which is why we put together a guide listing the best coffee bean storage devices out there. Bad coffee storage is the biggest culprit of producing stale coffee. Here are 6 of the best coffee bean storage devices that combat staleness and promote freshness, allowing you to live your carefully planned life to its maximum efficiency. One of the main reasons stored coffee goes stale is exposure to CO2- this canister eliminates said exposure with its one-way airtight valve system, leaving your coffee packed with as much flavor as it had when you put it in there. The built-in freshness calendar helps you accurately determine how long you have on your current batch, so there’s no more estimating. Spacious design holds either 16 oz whole coffee beans or 14 oz ground coffee. 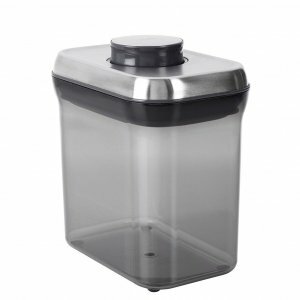 Another common reason coffee loses freshness is exposure to UV light; this canister is made out of stainless steel, so your coffee will be stored in absolute darkness. 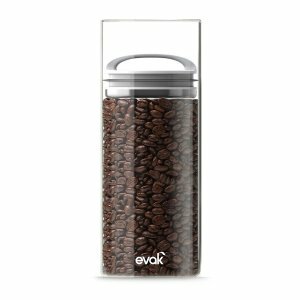 This airtight container comes in 9 different colors and holds a whooping 1 lb of coffee. Tea people, this is a great storage device for loose tea as well! 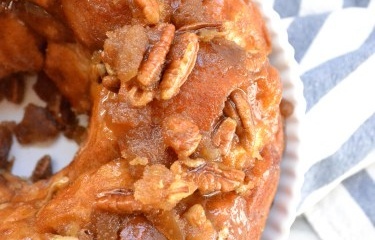 It will hold about 10-16 oz Green or Darjeeling tea. The two-way valve system allows any CO2 that got into the container to be slowly let out; this allows the coffee inside to still maintain its flavor while simultaneously eliminating the threat to it. 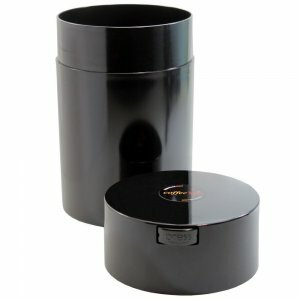 Solid NSF and FDA approved plastic offers extra protection for light sensitive coffee and tea. OXO are some of the top dogs in the coffee device industry. If you are looking for other coffee-related gifts or products, we think their Burr grinder is the best one you can buy on the market! For such quality (not to mention quantity- this canister is 1.5 qt! ), you can’t beat the price. It does have a 2.5 qt. option, but the price more than doubles to $44. Not only can you store your coffee and tea, but spices and other goods that need to be kept dry, dark, and sealed! Stackable grooves allow this container to be stored virtually anywhere in your kitchen pantry or counter; bonus that the chic design makes open display an aesthetic choice whereas other canisters do not. 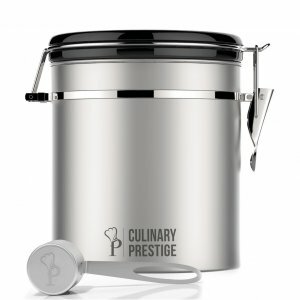 This canister was voted as the best for preserving freshness. 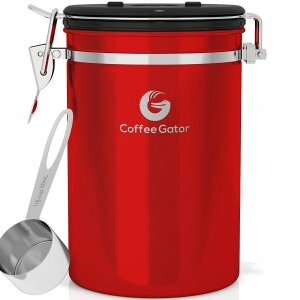 Its airtight vacuum seal and durable stainless steel material allows no air or moisture to sneak in, protecting the freshness of your coffee. The device also comes with a complimentary bonus coffee guide that offers extra knowledge and tips about brewing your coffee! If you buy from BlinkOne directly on Amazon, they will provide you with a Proof of Purchase which guarantees you a Lifetime Warranty “against defects in materials and workmanship”. The canister is a generous size as well, holding up to 18 oz whole or ground coffee. That should get you through the week…right? If you like to stare lovingly at your coffee beans rather than hiding them away, this might be the storage device for you; unlike most of its counterparts, this container is clear- not stainless steel. A transparent container seems like something that belongs hidden away in the pantry, but this device has won “4 internationally recognized awards for its cosmetic design” as well as its “practical functionality”. Like the Coffeevac, this device has a two-valve system which lets out any air that may have seeped in slow enough to maintain the coffee beans’ freshness. The EVAK comes in 3 convenient sizes, making it perfect for everyone from single cup drinkers to entire families. This canister is practicality incarnate. Its one-way valve system eliminates any air or light from getting in, the little wheel on the lid allows you to track the expiration date of your coffee, and all 4 options come in spacious sizes with room for 16-17 oz whole or ground coffee, respectively. 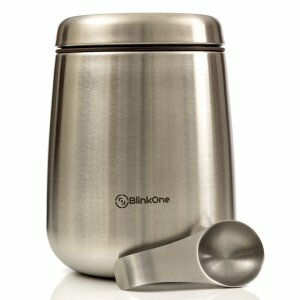 Like the BlinkOne, this product comes with a complimentary e-book full of brewing tips as well as a scoop. Many users compliment the versatile design- it looks sturdy and durable, which often leads to boring design, but this device is more aesthetically pleasing and somewhat customizable (can choose from Silver, Grey, Blue, or Red). 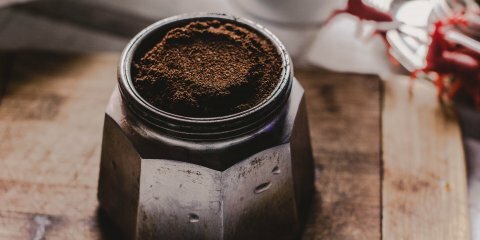 All in all, even a novice coffee drinker should have a coffee storage device that keeps coffee beans fresh whether you grind them for later or keep them whole. You spent good money on them probably, why not keep them around longer? The most important thing is that you have a coffee storage device that saves all the coffee.